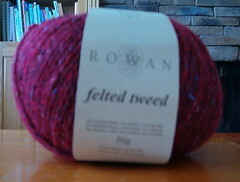 The Rowan Tweed is for Salina in the Vintage Style and I got the Manos to make a cross hatch scarf. 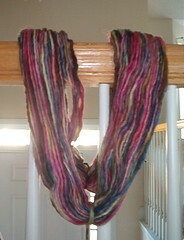 The pattern used to be available, but I guess it's going to be released in creative knitting magazine soon. 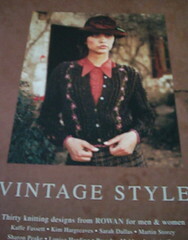 I may have it stashed away in a binder of patterns I collected when I first started knitting. 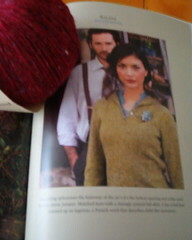 edited to add: I found the scarf pattern and it was actually from Sheep in the City. Unfotunately it's no longer on her blog, so I can't give a link to the pattern. 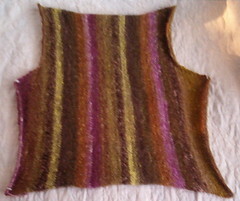 I've made that cardi in the same colorway! It's verrrry scoopy. Did I know you where in atlanta? I an north of atlanta. PS, I think it would be great if you decided to have another, and you had a little girl! Happy Birthday to you :) Sounds like some great fun shopping despite the chaos. Your cardigan looks great!